Fashions for today’s wee ones are hot! From cute crocheted hats to chic vintage-inspired wear to sweet and cheeky tops, here’s the scoop on everything fun and fashionable for the under-6 crowd. These sweet dresses by Kicky Pants are perfect year round and can be layered with leggings. All Kicky Pants clothing is made from their proprietary blend of certified organic bamboo. Print dresses, $34. Solid dresses, $32. This highly water-resistant Girl's Puff Rider Jacket by Patagonia will keep her stylishly comfortable and warm throughout the winter season. $149. Available at Junior Towne, Anchorage, or visit patagonia.com. 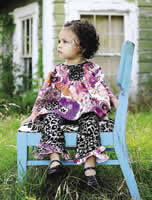 Any kid will look cool in these hand-embroidered jeans with “Peace Flowers” and cardigan from Mimi & Maggie. Jeans, $58-$62; Cardigan, $44-$46. 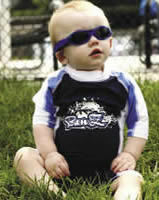 Adventure Banz by Baby Banz Inc. is the ultimate in children's sun protection featuring a silicone nose and brow piece for added comfort. $17. Available at Sweet Camo Babytique, or visit sweetcamo.com. Two sweet looks in casual dressing: A garnet long sleeve front pocket shirt with corduroy skeggings (skirt + leggings), $58-$60; and a long-sleeve denim dress with coordinating cotton tights, $52. Both from Le Top. This layette gown by Kicky Pants features paws to protect from scratching and an easy elastic bottom for easy diaper changes. And Kicky Pants knot hats are a perfect add on. Made from a proprietary blend of certified organic bamboo. Layette gown, $26. Knot hat, $10. This crochet hat by krazykidlets is made with 100-percent cotton to allow for breathability, which means it can be worn not only during cold winters but also for summertime camping and the cool spring and fall nights. $26.95-40.95. Visit facebook.com/krazykidlets. She's sure to be breaking hearts in this squareneck tunic set from Havenbaby's Love Rocks Collection. $52. Sit. Stay. Roll over. Cute baby! Fetch these dog-gone cute outfits featuring puppy faces and 3-D ears from Le Top. $34-$44. Cozy your little monster up in this dinosaur-inspired fleece bunting by Columbia that's as warm and toasty as they come. Fold-over cuffs keep hands and feet warm and the zipper secures with a tab-snap at the top and provides easy access for fast, no fuss diaper changes. $30. For a list of local retailers, visit columbia.com. Make a splash at your next shower or put a smile on your favorite mom with an Urban Smalls gift set. Top, track pants and hat for $59. Available at Nordstrom, or visit urbansmalls.com. This Peace Suit from Obermeyer is one fun snow suit with bright colors and prints. Reinforced double layer seat and knees and elastic ruching for the skier or freerider. $169.50. For a list of local retailers, visit obermeyer.com. 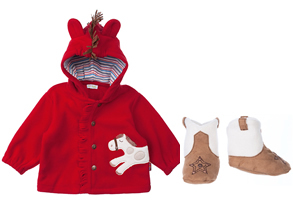 Go ahead: Horse around in this ultra comfy red polar fleece hooded jacket, $38-$40; and adorable booties, $18. Both from Le Top. The waterproof and breathable Obermeyer Volt Suspender pants, featuring the I-Grow system, cover your children in warmth to keep them comfortable and dry while on the slopes. $89.50. For a list of local retailers, visit obermeyer.com. 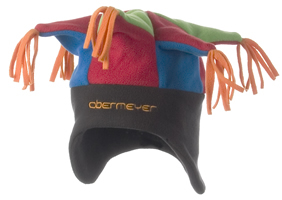 Built with only the finest and warmest microfleece fabric, the Heel Clicker by Obermeyer provides a super soft insulation wrapped up in a hat your little one will really love to wear. $25. Visit obermeyer.com. 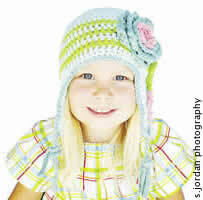 The large attached flowers and ruffled brim of this infant crochet hat by krazykidlets will melt anyone's heart. $22.95. Visit facebook.com/krazykidlets. Look dashing in this adorable reindeer tunic and leggings set by Mud Pie Baby. The warm cotton footed leggings come with built-in ruffle socks. $25 Available at Kiddywinks and Everything but the Princess. Visit everythingbuttheprincess.com or mud-pie.com. She’ll look pretty in pink in this Mud Pie Baby seersucker three-piece set. Pair with the matching ruffled cardigan for the perfect ensemble. 3-piece set, $30; Cardigan, $27. Available at Kiddywinks and Everything but the Princess. 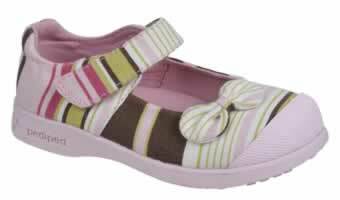 For fun and function, Addison by Pediped features vibrant multi-color stripes and a delicate bow. $32. 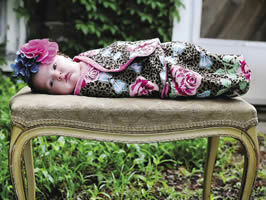 Available at Belles and Beaus Babies Children Maternity, or visit bellesandbeaus.biz. Pair this hat and mitten set from SmartWool with the baby sock sampler and keep your little guy snug as a bug all winter. Hat and mitten set, $30. Baby sock sampler, $18.95. Available at Blueberry Baby, Fairbanks, or visit smartwool.com. 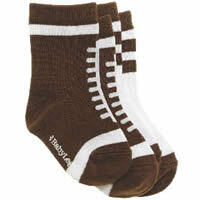 Make every step a touchdown for your kiddos with these End Zone Baby Socks by Baby Legs. $10. Available at Sweet Camo Babytique, or visit sweetcamo.com. The Toddler's Poodle and Doodle by Simple Shoes are eco-friendly washable suede shoes with a soft and fuzzy certified organic cotton fleece lining. $36-38. Available at Blueberry Baby, Fairbanks, or visit blueberrybaby.org. For a list of local retailers, visit simpleshoes.com. From cool weather to cool style, Mia Boots by Pediped are sure to keep your little one's feet safe and warm. Faux fur and delicate paink stitching finishes the chic look. $28. Available at Belles and Beaus Babies Children Maternity, or visit bellesandbeaus.biz. For a list of local retailers, visit pediped.com. This Rufflebutt Diaper Cover by krazykidlets is roomy enough to wear over a disposable or cloth diaper. Can be worn alone as a fashion statement or as bloomers under a dress. $18.95. Visit facebook.com/krazykidlets. These wool Baby Slippers by Padraig are sure to stay on little feet. Available in a kaleidoscope of brilliant colors. $32. Available at Blueberry Baby, Fairbanks, or visit blueberrybaby.org.